Conventional pre-amplifiers contain active circuits for buffering and amplifying the incoming line level signal before passing it on to a power amplifier. Active circuits always DEGRADE the quality of the music signal by introducing noise, phase shifts and distortion. 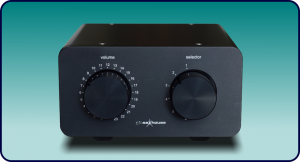 At normal listening levels, the signal is actually attenuated by the volume control – so why use a conventional pre-amp? 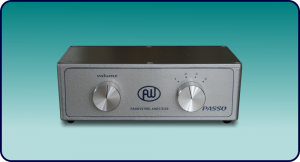 A Passive pre-amplifier also attenuates the signal to the desired listening level and selects the desired source but without any active circuits at all. With only one passive component, a resistor, in the actual signal path degradation is virtually eliminated – allowing every nuance of the music to shine through! Our Passive Pre-Amplifiers are built with selector and attenuation switches, wiring and resistors of the very highest quality to ensure long life and an unsurpassed musical listening experience! Conventional pre-amplifiers contain active circuits for buffering and amplifying the incoming line level signal before passing it on to a power amplifier. Active circuits DEGRADE the quality of the music signal by introducing noise, phase shifts and distortion.